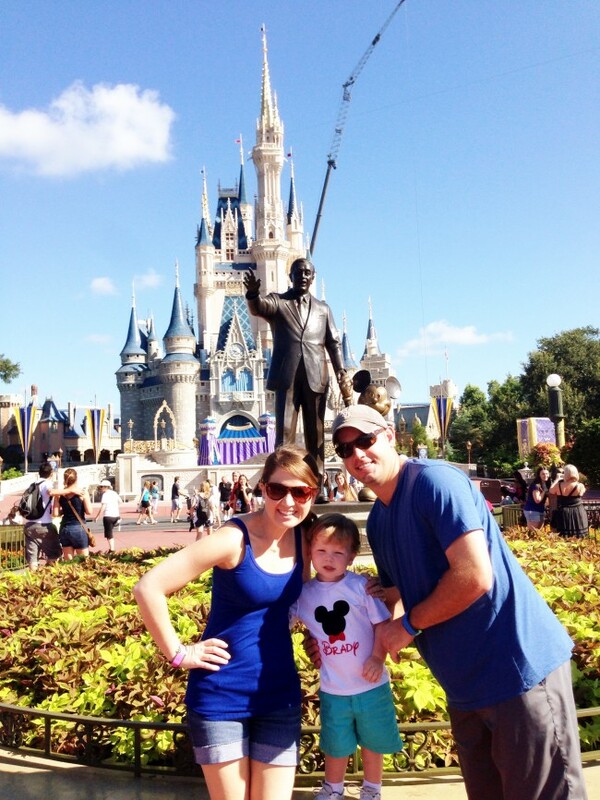 This weekend, we took Brady to Disney World for his FIRST overnight vacation (excluding a gazillion trips to Pensacola to visit his Nana and Pop Pop). It was a BLAST. Included some of my top ten favorite Brady moments ever. I’m excited to share some tips and tricks we learned on our way. First of all, I am a big Disney fan. I love how much thought they put into making your visit truly magical. I’m not, however, a Disney Veteran like my Mom and Mother-In-Law. They LOVE Disney and have visited a gazillion times, I’m sure. They know all the ins and outs, every hidden Mickey and the secrets to navigating the parks successfully. I went to Disney with Bryan and Brady a bit of a novice. 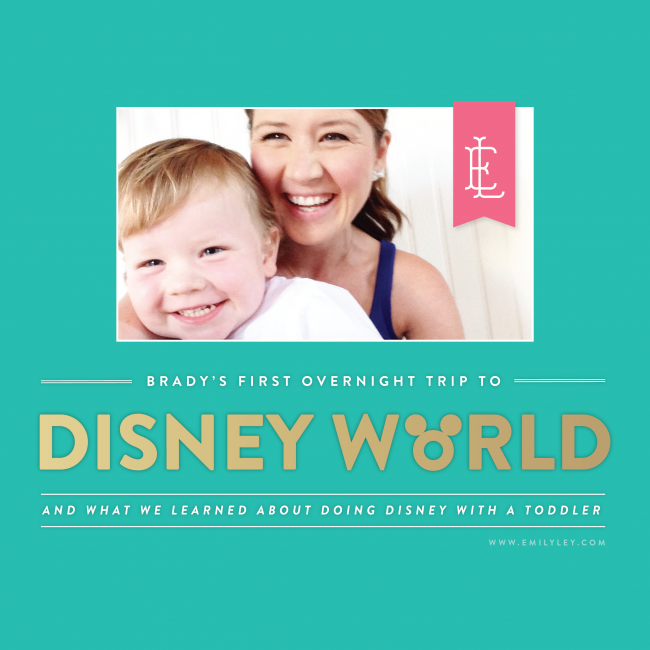 Normally, I don’t like to plan everything out when we visit Disney (Brady has visited three times prior to this starting when he turned two in February; this was his first overnight stay) but this time I wanted to make sure we made the most of our three day trip. 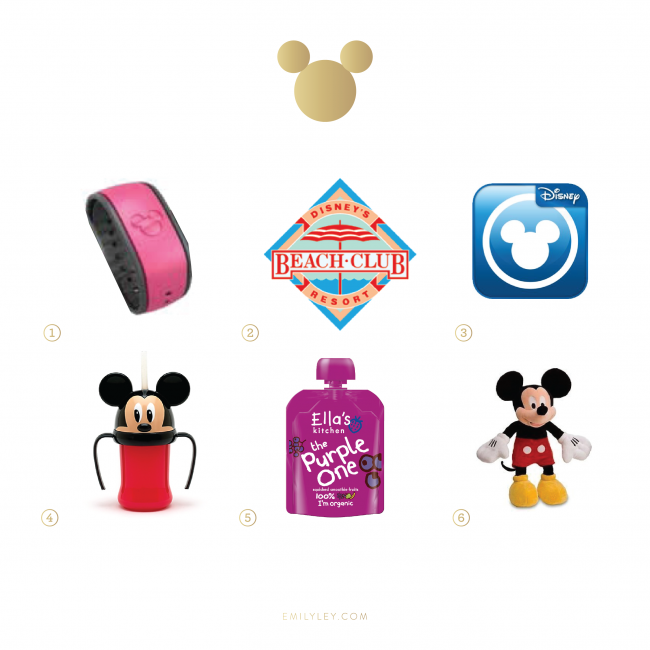 MAGICBANDS: I was excited to find out about Disney’s NEW MagicBands. We were selected (along with a lot of other guests this weekend) to test out this new system. About a week ago, I received a letter in the mail inviting me to personalize our MagicBands and begin planning our Disney Experience online. I chose colors for our bands (they’re really nice rubbery bracelets you wear throughout your stay) pink for me, blue for Bryan and (his favorite) red for Brady. They came in a really nice presentation box with our names on them. But, these bands are really magic. They carry around our resort reservations, FastPasses, dining reservations and even our account information if we’d like to charge purchases to our room. Don’t worry, those things require a secret PIN only we had access to. Overall, they were AWESOME. 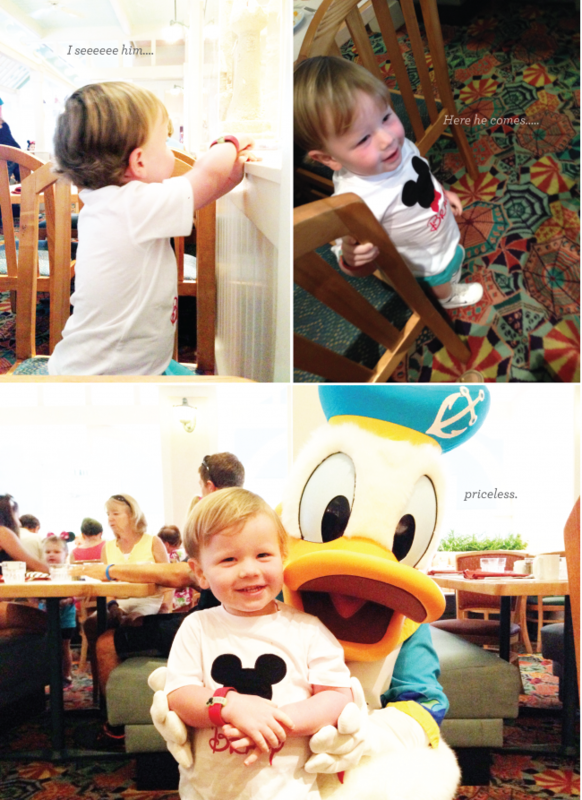 We could even unlock our room door with them at Disney’s Beach Club! DISNEY’S BEACH CLUB: Speaking of Disney’s Beach Club… WHAT A PLACE. We are fans for life. When we arrived to our resort, we walked in with a sea of other guests checking in. A cast member approached us and asked me if I was Mrs. Ley. Bewildered, I said yes. And he immediately bent down to shake Brady’s hand. “Welcome to Disney World, Brady!” he said. I cried. Why do I ALWAYS CRY at Disney World!? I’m so impressed by them. But mostly it was Brady’s face that got me. He was excited they knew his name. Our room was wonderful (we got the standard view and it was fine! ), the sand bottom pool was bliss and having an ice cream parlor (Beaches & Cream) on the bottom floor is never a bad thing. We took the resort transportation (boat and bus) to and from the parks every day and that was super convenient. More than anything, there’s something magical about staying on property. And because we have annual passes, we got a GREAT rate on our room. 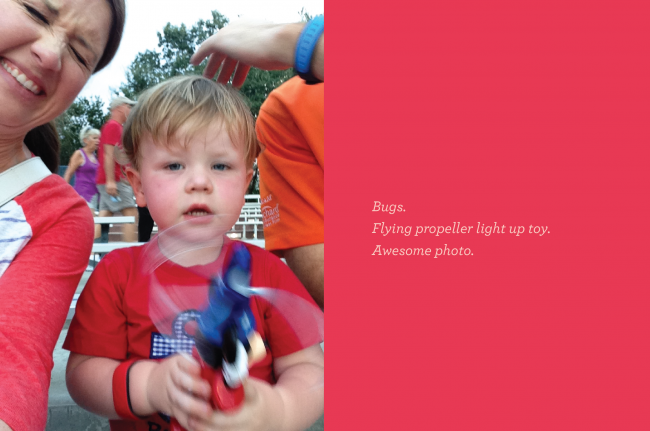 THE “MY DISNEY EXPERIENCE” APP: This app was amazing. I loaded it onto my iPhone and used it throughout our visit to find attractions, book or update FastPasses and make plans. While we were on the bus to Fantasmic on Friday night, I overheard someone say that Disney was now allowing you (if you had a MagicBand!) to book a FastPass for the Electrical Parade at Magic Kingdom. We were planning to stay and watch that parade on Saturday night, so I hopped into this app and reserved a FastPass. Because we had this, we were able to have access to a special reserved section right smack in front of the castle on the curb for the big parade. Brady LOVED IT! The parade is late at night and all the dancers and floats are covered in lights. Very fun. For the record, only ride rides when you have FastPasses. Those lines get LONG and we were able to hop right to the front with ours! Brady’s favorite… hands down… It’s a Small World. SIPPY CUP: Mom-of-the-year here forgot to pack Brady a sippy cup, so the minute we got to the first park we picked one up and filled it with water. Thank goodness because it was HOT. Way warmer than I expected. I even got a little dehydrated on Saturday morning and that was no fun. Brady stayed hydrated and cool with his sippy cup. A good $5 investment. BAG OF SEMI-HEALTHY TREATS: Brady must be growing or something because he is starving ALL. THE. TIME. In anticipation of “Mama can I have a banana/grapes/raisins/cookie/sandwich/chickennuggets,” I packed his dinosaur backpack with Ella’s Kitchen organic squeeze packs (we like the green ones the best – peas and pears), yogurt raisins, organic fruit strips and these new organic PBJ sammies I found at Target. This was one of the smartest things I did. Disney’s made an incredible effort to offer healthier food choices, but to save a little cash, having these on hand was awesome. And I’m pretty sure he ate every last thing I packed. This picture made me laugh. I was trying to pose the perfect pre-Fantasmic family shot. Bryan is shooing bugs out of my hair (?!) and Brady is smacking me in the face with his spinny-lighup-glow-in-the-dark Mickey toy. My best moment. 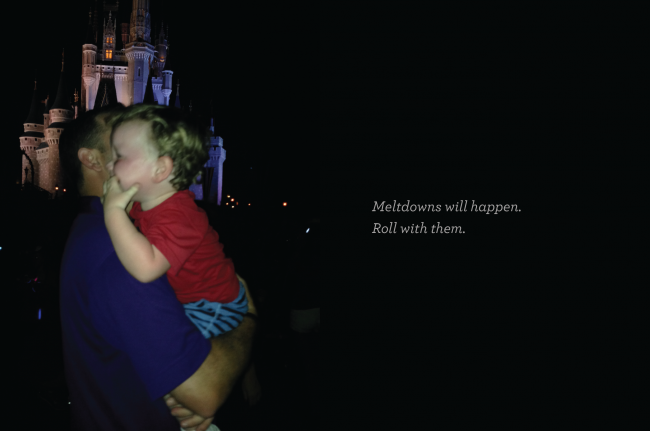 PS: Thanks, Disney, for crafting incredible memories for families. Watching Brady be brave on the Winnie the Pooh ride (what he calls his “first roller coaster”) and seeing his eyes LIGHT UP as he stalked Donald Duck through our character breakfast at Cape May (culminating in the BIGGEST hug ever) filled my heart to its brim. He hasn’t stopped talking about our experience since we got home.